First rod catch of sea trout for a century. A sea trout has been caught by an angler on the River Leven in Teesside – marking a huge milestone in efforts to bring migratory fish back to the area. In what is believed to be the first rod catch of sea trout on the Leven since the Industrial Revolution, the angler who landed the fish reported the exciting catch to the Environment Agency. The Leven is a tributary of the River Tees, where salmon and sea trout catch data show that migratory fish are returning to the catchment following decades of absence. Water quality in the River Tees, following the Industrial Revolution, used to be so bad that fish could not live in it. But the Environment Agency and its partners have worked hard to improve water quality and ensure that fish can move upstream. This involved the construction of a fish pass on the lower River Leven in 2007, allowing fish to reach spawning grounds upstream. 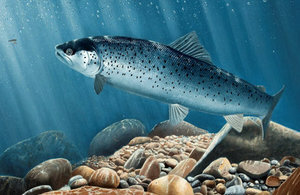 The catch on the Leven comes after a fisheries survey in 2010 recorded a salmon in the river. I’m really excited about this catch. There have been rumours among anglers that sea trout are back in the Leven, but now we have cast-iron proof. We constructed a fish pass on the lower River Leven in 2007 that would allow fish from the River Tees to return to spawning grounds on the upper Leven, which had previously been cut-off for over a century. Salmon and sea trout are in important part of our rivers’ ecology and they are a valuable economic fish stock – so this is fantastic news for the North East. I am delighted to see that these little ‘bars of silver’ can now ascend the River Leven once again after an absence of scores of years. It’s wonderful. Rod catch data show a significant rise in salmon and sea trout on the Tees since the early 1990s. It is predicted that the Tees rod catch will meet its catch target of 485 rod caught fish by about early to mid 2020s if it follows the same pattern of recovery as the Tyne and Wear.